Sachin and Binny Bansal of Flipkart don’t run the largest e-commerce company in India. It is run by a man called Viresh Oberoi. Oberoi is the CEO& MD of mjunction, which runs the largest online steel marketplace in the world. mjunction is a joint venture(JV) formed by SAIL and Tata Steel. In 2013-14, the Kolkata based company’s transaction value was more than Rs 43,000 crores compared to Rs 6,000 crore (as announced) gross merchandise volume of Flipkart in the same year. In fact, the revenue of mjunction in 2013-14 is more than twice the annual Gross Domestic Product (GDP) of Maldives. Founded in February 2001, the firm has done more than Rs 2 lakh crore worth transactions till date. Facts like these provide two crucial insights about the B2B (business to business)e-commerce space. One, the massive volumes of business that sector does. And two, the lack of hoopla in the space. So, how big is the sector? The global online B2B market is expected to be twice as big as the B2C (business to consumer) market by 2020 at $ 6.7 trillion, according to Frost& Sullivan. Globally, China and US are the leaders in the segment. According to a study by Walmart, the Indian B2B e-commerce industry is currently valued at $300 billion and is expected to touch $700 billion by 2020. Going by the IAMAI Deloitte e-commerce report, the present valuation of online B2C business in the country stands at $13.6 billion in 2014 and is expected to touch $16 billion by the end of 2015.
mjunction was started as metaljunction. com in 2001 with a startup capital of Rs 8 crore with Viresh Oberoi at its helm. The firm’s market value zoomed to Rs 800 crore by 2011-12. The business volume of mjunction in terms of transaction value rocketed from Rs 94.35 crore in FY 2002- 03 to Rs 41,134 crore in FY 2012-13 at a compound annual growth rate(CAGR) of 74 per cent. The secret behind the company’s stupendous success is pretty simple. “The way you do it online has to be way superior to the way you to do it offline, which is not merely being online. It is really (about) understanding what the problems are, in the current offline process and to solve those problems,” says Oberoi. But companies like mjunction are few and far between. In the past decade, the spotlight has always been on the flashier B2C segment with news of huge amounts of funding flowing into startups and making entrepreneurs into poster boys overnight and turning firms into unicorns (companies with more than a billion dollar valuation). However, things are slowly changing. There is a new rung of entrepreneurs who have spotted the huge potential of the B2B segment in India and a few investors are waking up to the next big thing. Brijesh Agrawal has been a known name in the offline B2B segment for a long time because of his firm IndiaMART. He knows that every B2B transaction is at least 2.5 times bigger than B2C. That is one of the reasons why he founded Tolexo, an online B2B market place, in December last year. Tolexo focuses on creating demand from, and supplying to, construction, manufacturing and hospitality companies. “There are around 47 million SMEs in the country with most of them in manufacturing,” says Agrawal. This is Agrawal’s target and hope. IndiaMART gets around $16 billion worth of enquiries every year, according to a source in the company. Tolexo, in less than a year has managed to get more than 3000 sellers on its platform with a GMV of around $1 million per month. It gets 1.5 million visits a month growing at a rate of 50 per cent month on month. “We get double the margins compared to B2C,” says Agrawal. Not only are the margins higher, the costs in the B2B space are also much lower. Unlike B2C companies, these companies don’t have to fork out precious investor money for brand building. Most of it happens through word of mouth through customers. Overall order sizes are much bigger. All these factors put together makes B2B companies an attractive proposition for investors, as they take a shorter time to hit profits. And since, the orders come in bulk from a buyer or a set of buyers, these companies don’t have to resort to deep discounts unlike their B2C counterparts who use VC money to fund the discounts. “Nobody in B2B sells below cost,” says Agrawal. The differences don’t end there. The B2B space is attracting a different breed of entrepreneurs too. Unlike the B2C space which is swarming with college dropouts or greenhorns with very little work experience, B2B entrepreneurs are experienced professionals, often with a deep understanding of offline B2B industry as well. After spending 18 years at Godrej Infotech, at age 47, Sanjay Deokule took the entrepreneurial plunge and set up getmymachine.com, in October 2014. It is a unique online B2B marketplace dedicated to providing equipment such as machine tools, material handling equipment, earth moving equipment, and plastic machinery – to industrial buyers. “Conceptual capital equipment selling was initially very tough for us. Now, we have more than 1000 vendors on our site,” says Deokule. Or take the case of siblings Swati (38) and Rahul Gupta (36). Their father was already into the industrial distribution business. After studying and working in the US, they wanted to come back to India to start an online B2B business, since they found that it was not easy to procure industrial goods and spotted an opportunity. Swati Gupta is a Carnegie Mellon alumnus and has worked for Bain& Co. in New York. They launched industrybuying.com in 2013. “We want to be the Grainger of India,” says Gupta. Grainger is a successful US based industrial supplies company. Now, the company has more than 200 employees. 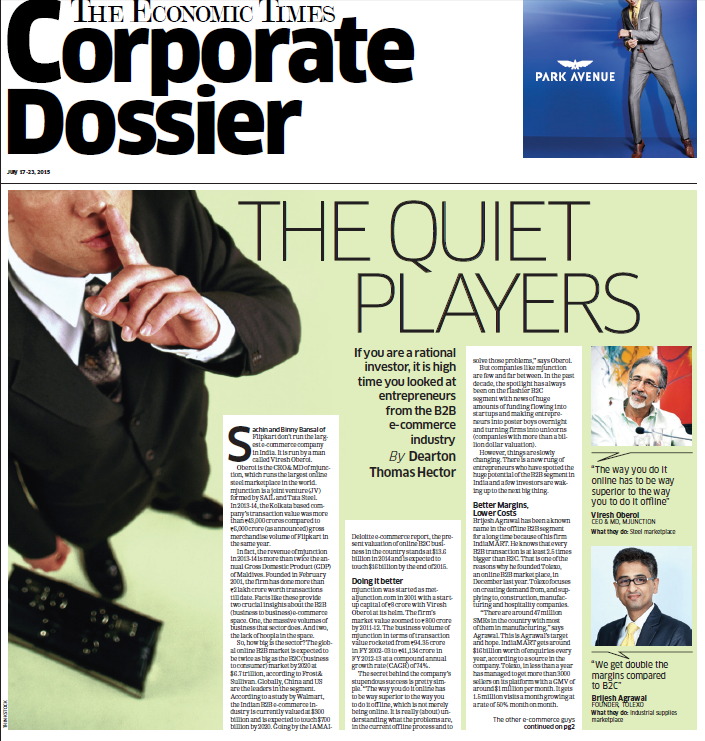 Industrybuying’s customers include Honeywell, Siemens, Tata Power, and Havells. Venture Capital fund SAIF Partners has invested $2 million in the firm. Mukul Singhal of SAIF Partners is confident that this is a good time to invest in the B2B sector. “It’s the right time. Internet penetration is fairly high and increasing year on year. Users are using B2C products like Flipkart, PayTm and Snapdeal. This will decrease the adoption curve of B2B business,” says Singhal. But not every B2B business is about putting a buyer and seller together on an online platform. Power2SME is not a marketplace. It aggregates demand from a group of buyers and puts that across to the sellers, thereby helping SMEs who have even the smallest of orders. “The average order is around Rs 15 lakhs. We were profitable from day one,” says R Narayan, Founder, Power2SME. Power2SME has a run rate of Rs 300 crore per year and 70-75 repeat customers a month, claims Narayan. Run rate is an extrapolation of the current monthly results. Power2SME is funded by Accel Partners, Kalaari Capital and Inventus Capital Partners. The total funding in the company till date from all the investors is around $11 million. “For a manufacturing SME, 60- 70 per cent of their revenue goes into procuring raw materials. So, through this clubbing of demand, if they can get a saving of 1-5 per cent it is a big deal for these SMEs,” says Parag Dhol, MD and partner at Inventus Capital Partners. Ashok Parmar has a flourishing paints business in Rajasthan and wanted to find new customers in Mumbai. What he lacked was the sales, operational capability and the deep pockets to start operations in Mumbai. Enter Bizongo, an online B2B marketplace founded by three IIT-ians based out of Powai in Mumbai. Even though Bizongo is a new player in the market, having started-up this April, it is already getting forty enquiries a day, according to Aniket Deb, cofounder of Bizongo. They are funded by a group of individual angel investors. 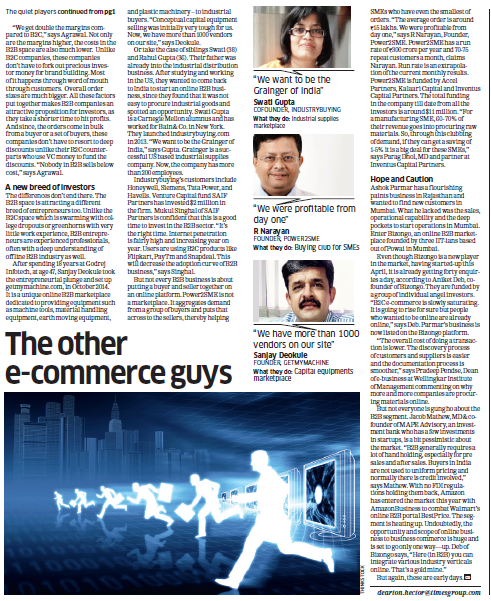 “B2C e-commerce is slowly saturating. It is going to rise for sure but people who wanted to be online are already online,” says Deb. Parmar’s business is now listed on the Bizongo platform. “The overall cost of doing a transaction is lower. The discovery process of customers and suppliers is easier and the documentation process is smoother,” says Pradeep Pendse, Dean of e-business at Wellingkar Institute of Management commenting on why more and more companies are procuring materials online.